Profile Response: Gerard Black Elk, Rapid City, SD | How Will We Live Tomorrow? Gerard Black Elk is a Native American from the Sioux Tribe. 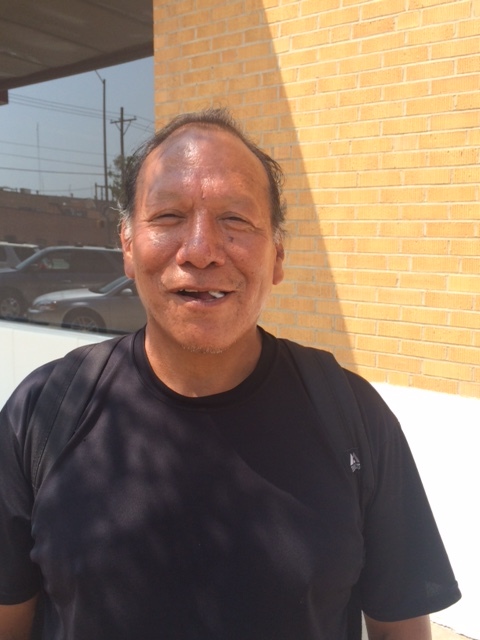 I approached him on the street in Rapid City, SD and we talked. “The urgent answer is, can we all get along? I would like to see people be more approachable. “I am concerned about addition, which is see so much of in my community. Addiction is a sign that we have something we cannot control, but are unable to acknowledge that. I was in a group once when the leader said, ‘Who’s the second most selfish person here? The person sitting next to you.’ We have to accept ourselves as we are. We have to accept that we are all selfish; selfishness is part of our nature. “So many people are drowning in addiction. I struggle with people allowing that to happen to them. Then I look at my own life. I am 58. I’ve been to college, I’ve been in prison, I’ve been President of the University of Washington Native American Club and I’ve hung out with folks who don’t spend a minute thinking about anything beyond the next drink. This allows me to connect with anyone. “When Native Americans began to lose our language we began to lose part of ourselves. Picture this. You and I are Native Americans. We are standing on top of a hill. Suddenly I fall over. I’m dead; struck by a bullet. I have never seen a rifle; I don’t know what one is. I have no context for what happened. That is the Native American experience: rifles, small pox, Western civilization. We had not context for what happened when the railroads came. “I could not live with myself if I thought there was no tomorrow. I wake up in the morning and I think: all the good that happens will flow from Jesus; all the bad, from man. This entry was posted in Uncategorized and tagged addiction, Native American, Sioux, South Dakota. Bookmark the permalink.